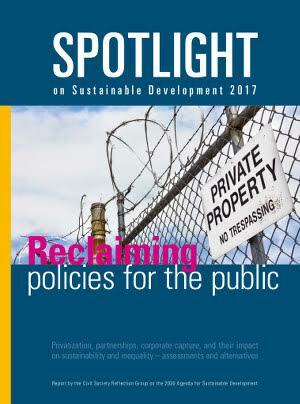 New York, 10 July 2017: A global coalition of civil society organizations and trade unions presents today the report Spotlight on Sustainable Development 2017. It is published on the opening day of the High Level Political Forum at the United Nations in New York. The report provides the most comprehensive independent assessment of the implementation of the 2030 Agenda and its Sustainable Development Goals (SDGs). “In the 2030 Agenda governments committed to a revitalized Global Partnership between States and declared that public finance has to play a vital role in achieving the SDGs. But in recent decades, the combination of neoliberal ideology, corporate lobbying, regressive fiscal policies, tax avoidance and tax evasion has led to a massive weakening of the public sector and its ability to provide essential goods and services. “The same corporatized strategies and fiscal and regulatory policies that led to this weakening have enabled an unprecedented accumulation of individual wealth and increasing market concentration. "The proponents of privatization and public-private partnerships (PPPs) use these trends to present the private sector as the most efficient way to provide the necessary means for implementing the SDGs. But many studies and experiences by affected communities have shown that privatization and PPPs involve disproportionate risks and costs for people and the public purse. PPPs can even exacerbate inequalities, decrease equitable access to essential services and jeopardize the fulfilment of human rights. The 160-page report is supported by a broad range of civil society organizations and trade unions, and based on experiences and reports by national and regional groups and coalitions from all parts of the world. Its 35 articles and textboxes cover all sectors of the 2030 Agenda and the SDGs, and reflect the rich geographic and cultural diversity of their authors. The Spotlight Report will be disseminated and discussed at various events at the High-Level Political Forum over the next two weeks. The report's key findings and recommendation will be presented and discussed by the authors at a round table-event on Tuesday 18 July. Report of the Reflection Group on the 2030 Agenda for Sustainable Development.